People often ask me if I studied medicine or biology when they see my work. And though I've never actually taken a biology class (I was more into physics in high school and university) I'm finding myself more and more interested in it. I was inspired to make these sculptures by the paper mache models I saw in the Mutter Museum of Medical History in Philadelphia, and spend a lot of time looking at anatomical diagrams and imagery. I'm still interested in physics and other sciences and get a huge kick out of art that is inspired by science. Maybe I'm too nerdy for my own good, but work like this gets my neurons firing like crazy with ideas and connections. 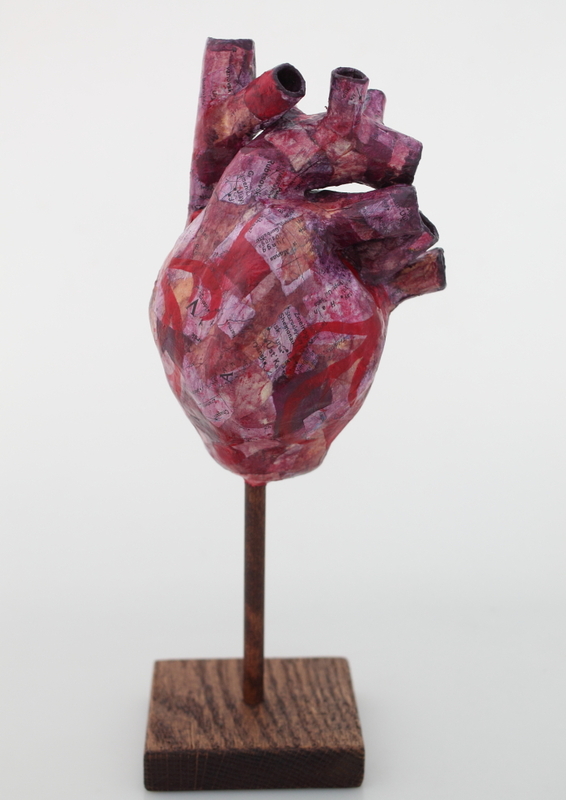 Laura Jacobsen uses printmaking and ceramics to depict her understanding of the mind. I especially love this series inspired by brain scans and made by imprinting ceramic with industrial objects. These playful sculptures of brain neurons called dendrites by Judith Modrak express the reality of neurological conditions. Read an interview with the artist here. With a double major in neuroscience and sculpture, Julia Buntaine has a fascinating portfolio of works exploring how the brain works. The multi-disciplinary organization Sciart works to bring artists and scientists together. See their online exhibit "EmBodied" about the link between our bodies and our inner selves. A fascinating Ted Talk on the mathematics underlying coral, lettuce and sea cucumbers, and how women were crocheting that math before mathematicians admitted that it existed. In the 1980s, Jim Sanborn installed a work of art in a courtyard in front of the CIA containing codes to be cracked. Some of them have been solved and some of them haven't. Jim describes himself as a "non-fiction" artist whose work also touches on radiation, magnetism, topography and geometry and more. Daniel Martin Diaz's Diagrams of the Soul emphasize the beauty of scientific diagrams in enigmatic and strange compositions that feel like a mix between hard science and mystical alchemy. Another actual scientist turned artist, Stephanie Nowotarski makes beautiful prints inspired by the scientific method and data collection. In Dear Data, two designers with backgrounds in data visualization sent each other postcards each week for a year. Each week they chose to collect data from their own lives on a particular topic like indecision, doors, or laughter and would each represent that data in their own unique way. Lisa Nilsson makes incredibly intricate images of the human body using paper quilling that are easy to get lost in. Kate McLean is interested in using all our senses to map data and has been using "small walks" to create interesting maps of her city and travels. Click here to see more of my own science-inspired artwork. Get in touch to buy a sculpture, or visit my Etsy shop for prints and cards.